It is a fitting epitaph. 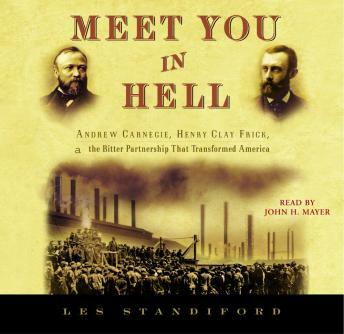 Set against the backdrop of the Gilded Age, a time when Horatio Alger preached the gospel of upward mobility and expansionism went hand in hand with optimism, Meet You in Hell is a classic tale of two men who embodied the best and worst of American capitalism. Standiford conjures up the majesty and danger of steel manufacturing, the rough-and-tumble of late-nineteenth-century big business, and the fraught relationship of “the world’s richest man” and the ruthless coke magnate to whom he entrusted his companies. Enamored of Social Darwinism, the emerging school of thought that applied the notion of survival of the fittest to human society, both Carnegie and Frick would introduce revolutionary new efficiencies and meticulous cost control to their enterprises, and would quickly come to dominate the world steel market. But their partnership had a dark side, revealed most starkly by their brutal handling of the Homestead Steel Strike of 1892. When Frick, acting on Carnegie’s orders to do whatever was necessary, unleashed three hundred Pinkerton detectives, the result was the deadliest clash between management and labor in U.S. history. WHILE BLOOD FLOWED, FRICK SMOKED ran one newspaper headline. The public was outraged. An anarchist tried to assassinate Frick. Even today, the names Carnegie and Frick cannot be uttered in some union-friendly communities. Resplendent with tales of backroom chicanery, bankruptcy, philanthropy, and personal idiosyncrasy, Meet You in Hell is a fitting successor to Les Standiford’s masterly Last Train to Paradise. Artfully weaving the relationship of these titans through the larger story of a young nation’s economic rise, Standiford has created an extraordinary work of popular history.